Bernanrd "B.J." 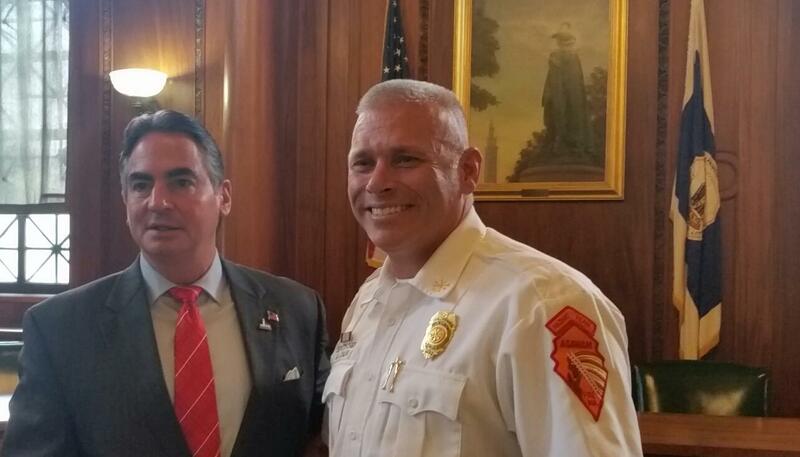 Calvi, deputy chief of the Agawam Fire Dept with Springfield Mayor Domenic Sarno after being announced as the next Springfield Fire Commissioner. A new leader has been announced for the largest fire department in western Massachusetts. Springfield Mayor Domenic Sarno has tapped Bernard “B.J.” Calvi, a deputy chief with the Agawam Fire Department, to be the new Springfield Fire Commissioner. Sarno described Calvi as a “go-getter” who rose to the top after a national search that produced almost 40 applicants. Calvi, who began in the fire services in 1995, said leading the Springfield Fire Department will be a career-culminating job.
" Everybody wants to make it to the top of the ladder, but these jobs are few and far between," said Calvi. " I am fortunate that Mayor Sarno has placed his trust in me to lead the department into the future." With more than 230 fulltime firefighters, Springfield’s fire department is roughly four times the size of the Agawam department,which has 57 firefighters on staff. "Leadership is leadership and if you can lead one group of people you can lead another group of people. It is all based on how you delegate authority and manage what is going on around you," said Calvi. Calvi, who has signed a five-year contract with a starting salary of $145,000, will succeed Fire Commissioner Joseph Conant, who was appointed to the post in 2013. Earlier this year, Sarno announced he would not renew Conant’s five-year contract. Sarno never explained why, but his decision was announced shortly after the mayor publically criticized Conant for the handling of a disputed residency requirement for deputy fire chiefs. Although employed in Agawam, Calvi said he has been a resident of Springfield for more than six years. Sarno said six semifinalists for fire commissioner – two currently employed by the Springfield Fire Dept. and four who are not – were interviewed by a selection committee that consisted of the mayor, the city’s Chief Administration and Finance Officer, Director of Human Resources, and the mayor’s Chief of Staff. The finalists were grilled in several areas including community relations, administration, and operations. They were also asked to describe responses to hypothetical scenarios.
" Commissioner Calvi answered those questions in a very succinct fashion, directly answered those questions and scenarios showing a very strong command and vision for our fire department to take it to the next level," said Sarno. " He is a go-getter. He is hands-on." Sarno said Calvi will become commissioner on January 24, 2018, the day Conant’s contract expires.
" I do expect a smooth transition to occur," said Sarno. A formal swearing-in ceremony for Calvi is also planned. There are clouds over the futures of the top public safety leaders in Springfield, Massachusetts. There’s fallout from the surprise move by the mayor of Springfield, Massachusetts to announce plans to hire a new fire chief. The Massachusetts Department of Fire Services’ new campus for the western part of the state is being dedicated tomorrow. The new facility took just a year to construct, but was decades in the making. The $13.4 million project built on the site of the former Springfield Fire Training Center is a state-of-the-art facility for firefighters from the western part of the state, according to state Fire Marshall Stephen Coan. Fire chiefs from western Massachusetts hosted state legislators and municipal officials at a breakfast this morning to lobby for a fire safety bill. The gathering was highlighted by a dramatic demonstration in the parking lot of the Log Cabin and Banquet House in Holyoke, where fires were started in two identical rooms. One fire raged out of control and destroyed a sofa, table, and TV set. The second fire was extinguished quickly by a water sprinkler that activated automatically.